The outcome of the Chinese GP looked pretty predictable from Friday onwards, as Lewis Hamilton dominated all practice sessions to go onto claiming the pole position, 0.043 sec ahead of his Mercedes team-mate Nico Rosberg, who’d start the race from second. 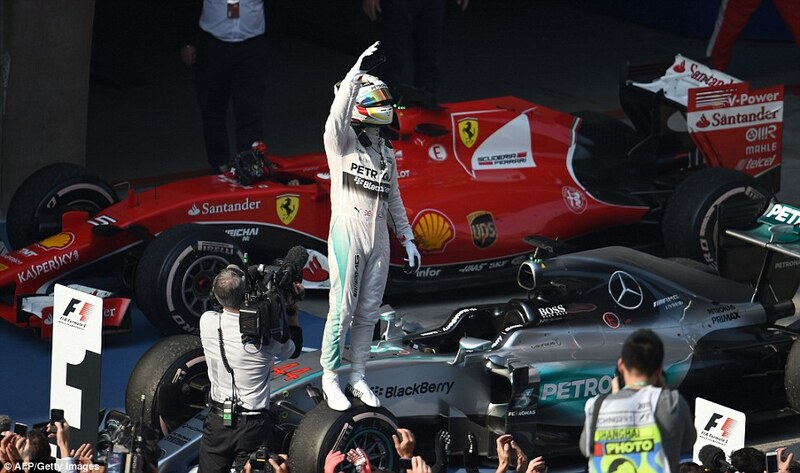 The Brit was the favourite in Shanghai, having comfortably scooped the win there a year earlier; but he still stomped his ground at the front of the grid when he parked his car askew following the formation lap to make sure no one would get in his way – especially Rosberg. The precaution was unnecessary; the competition simply wasn’t there, as the reigning world champion sprung ahead to lead the circus for all 56 laps; but his cautious drive that afternoon gave some fleeting hope for a turnaround of events, while causing frustration that would spill out into the post-race conference. “It’s just now interesting to hear from you, Lewis, that you were just thinking about yourself with the pace in front, and necessarily that was compromising my race,” Rosberg said. “Driving slower than was maybe necessary at the beginning of stints meant that Sebastian [Vettel] was very close to me and that opened up the opportunity for Sebastian to try that early pitstop to try and jump me. And then I had to cover him. 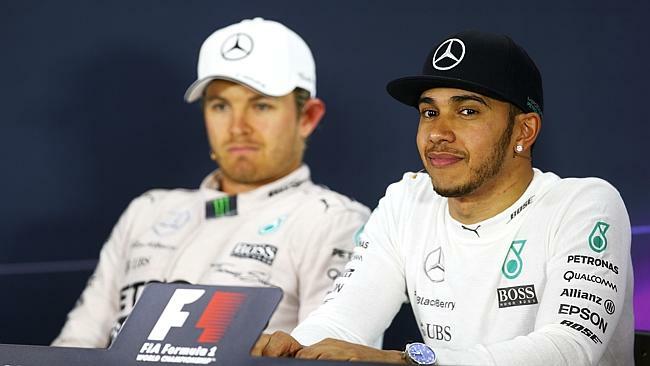 At odds: it looks like the start of a new row between the Mercedes’ drivers. The cause for the aggravation – other than Rosberg being reportedly advised by his management to “stop being a nice guy” and show his true colours – was Hamilton’s tyre preserving strategy which, according to his team-mate, hampered the German’s racing efforts and put the team’s 1-2 finish into jeopardy. The threat was to come from Malaysia winner Vettel, who admitted to have suffered himself from the pace control at the front in the way of tyre degradation. Other than some annoyed radio conversations, that was little to speak for the escalating conflict between the two Mercedes drivers until after the race – so the attention of the cameras during the race turned to the midfield, which currently seems to look a somewhat upsides-down version of the 2014 grid. 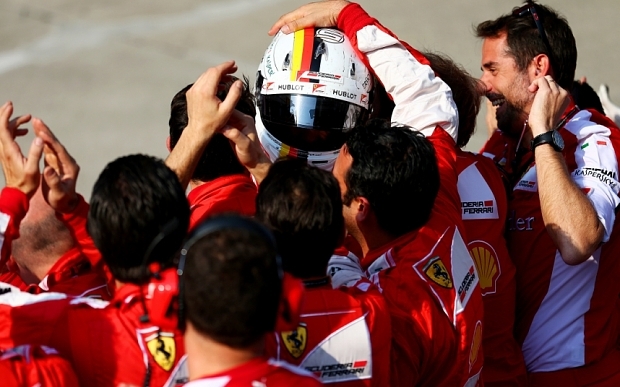 Like a Champion: Vettel’s arrival at Ferrari coincides with the team’s return to the front of the grid. While Williams had already hinted at their Mercedes-challenger spirit in the previous season and confirmed their potential with a 5-6 finish in Shanghai, they lost out on the podium glory to their key rivals – Ferrari. After their surprise win in Malaysia, the Prancing Horse has finally stood strong on all four feet, with Kimi Raikkonen putting team-mate Vettel under pressure at the front, before finally conceding to a 4. finish. On the contrary, Red Bull seemed nothing like a four-time champion outfit judging by the technical struggles of its drivers. Following a terrible start due to his car going into anti-stall mode at the launch, Daniel Ricciardo found himself fighting both Sauber drivers throughout the afternoon to move from the back of the grid to a 9. finish. While his team-mate Daniil Kvyat never made it that far, as his engine caught fire as early as lap 16. This was the Russian’s second DNF in as many races due to a fault with the package; and having already made three engine and/or gearbox changes this year, Red Bull are facing some painful penalties going forward this season. The mentioned Sauber drivers brought hope for a bright future into the heart of the midfiled team by once again scoring double points that afternoon. The other junior outfit, Toro Rosso, were also set to impress with their 17 year-old driver Max Verstrappen who fearlessly fought to stay in the top 10, before his efforts were cut short by yet another Renault engine failure. The issue left his car stranded on the start-stop straight for the last three laps of the race, effectively putting an end to any action that afternoon by calling out a safety car. 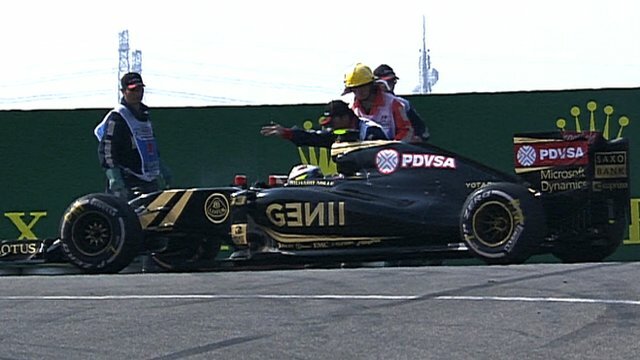 Wrong turn: after impressing with some overtakes, Maldonado’s afternoon went from bad to worse. Things looked more familiar at Lotus who seemed to have finally picked up their mojo to claim their first points of the season with Romain Grosjean crossing the line in 7.; but his team-mate Pastor Maldonado continued his unbroken streak of DNFs (did not finish) in 2015. After a series of impressive overtakes early in the race, the Venezuelan made a mistake on lap 34 when he overshot his turn into the pits, after which he spun out on track, putting the rest of his afternoon in question. He recovered, however – only to be taken out by a hit from Jenson Button as the two fought for 13. place. Other than the 5sec post-race penalty handed to Button for causing the collision, the team considered the afternoon a success, having delivered both cars across the line, with Fernando Alonso finally finishing a 2015 race – ahead of his team-mate, in 12. “We go to Bahrain hoping for more progress, although the circuit configuration doesn’t suit us, so heading to Europe will hopefully work out a little bit better for the team,” said Button after the race. So how much improvement can be expected a week after China? A tale-tell sign is the fact that Mercedes are back to their winning ways with a comfortable gap of more than 2sec to their closest rivals – and that’s on a tyre-preserving strategy. 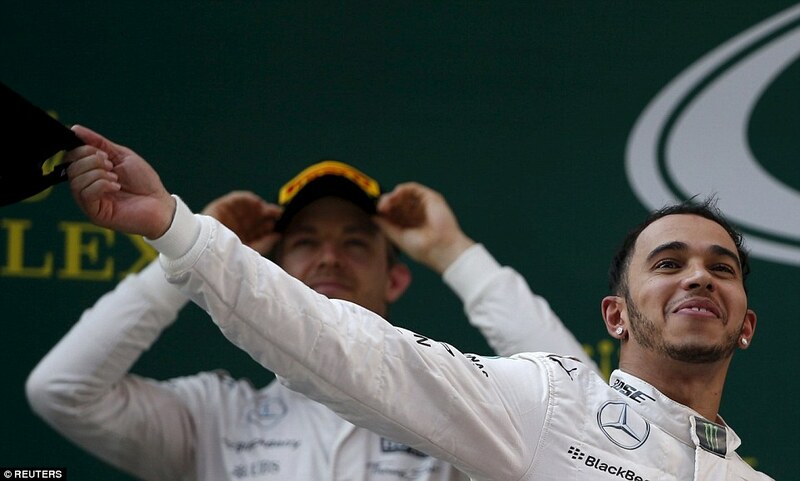 One man show: Hamilton was unbeatable in China, even when driving at a reduced pace.